Step 1: Download, install and activate TouchCopy. Step 2: Run TouchCopy and connect your iPhone, iPod Touch or iPad. Step 3: Choose the Books Tab. Step 4: Select your required books. The Book functionality is available only for iOS devices that have the iBooks application installed. With TouchCopy you can copy books from your iBooks App straight into iTunes. 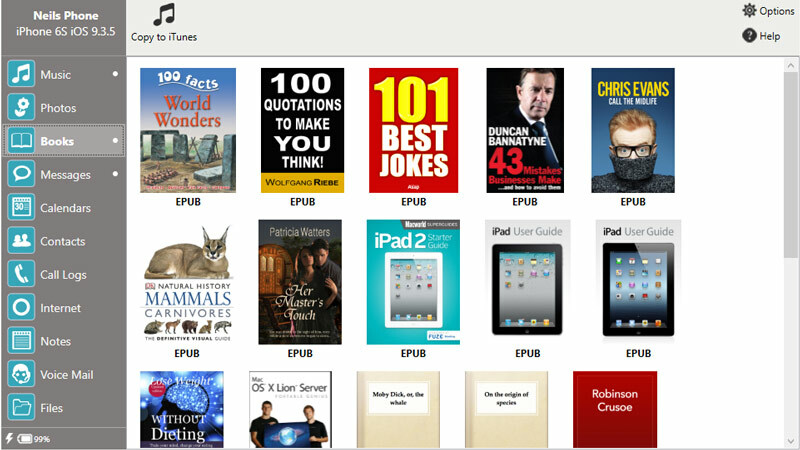 TouchCopy can handle EPUB formatted eBooks. To view the books on your iOS device, click the "Books" icon in the category list. TouchCopy will display all the books on your iOS device and indicate the format that each book has. If no books are selected, clicking "Copy To iTunes" in either the book viewer tool bar or the main TouchCopy control bar will copy all of the books listed into your iTunes library. Selecting a book or books in the list and clicking "Copy To iTunes" will copy only those selected books to iTunes.